If you've got a corporate party, fundraiser, or any other event planned in Monaco , arranging for a live band, comedian, celebrity, or speaker is easier than you'd anticipated. Whether it's a surprise for the guests or splashed on the front of the invitation to build excitement, booking big name acts for Your Event In Monaco is essential to its success. Providing all in one no-surprise price, Booking Entertainment has been assisting clients with full-service, turnkey events, including headlining entertainment, for almost twenty years. Almost any band or performer is available to help make your event or party in Monaco successful and entertaining. The overwhelming details that go in to live entertainment at your event are the same, regardless of whether you've chosen the Hotel Hermitage, Hotel Metropole Monte-Carlo or Fairmont Monte Carlo for your venue. These details include flights, ground transportation, hotel accommodations, staging, backline equipment, lights, sound, per diems, misc. rider requirements, fees, and an onsite team to produce the musical portion of the event. But the ability to relax and enjoy the evening with guests is what Booking Entertainment brings to the evening, by managing all of these details flawlessly for you. Our simple Entertainment Request Form is the best place to start. Here, you can inform us of the details of your upcoming party or event in Monaco so we can better assist you. You will hear from one of our agents within twenty-four hours, to chat with you about the process and see if you have any other questions. Once the best entertainment choice has been narrowed down, the agent will return with a turnkey price to include all the elements mentioned above. At this point, you can choose to move forward and have the agent send the formal offer. If the offer is accepted by the act, contracts are issued and Booking Entertainment handles everything else. Booking Entertainment is excited to take its almost twenty years experience in the business and use it to make your event in Monaco an unforgettable experience. We can act as a producer and handle the entire entertainment portion of your event, or you can have use just handle the contracting of the talent, in the role of an agent. Once you have an idea of how you want to proceed, simply submit your non-obligatory Entertainment Request Form below. If, even after searching our listed acts and packages, you are still uncertain as to what type of entertainment would be best for your event in Monaco , we will be delighted to help you explore your options and select the perfect act. Want to talk about your event? "When you are looking to book big name entertainment for an event, there are a number of pop up booking agencies on the web that if they are reputable, simply book the acts and leave you to handle all of the responsibilities of producing the entertainment portion of your event. Our entertainment booking agents have been personally trained by me to ensure that the entire booking process and event production is handled flawlessly and with the personal touch that I make sure goes into every corporate event, private party or public concert that we handle. My reputation is on the line for every show we do, and I ensure that both our clients and the acts / celebrities that we book are treated to our unprecedented level of service. Let our entertainment agent specialists show you how we can save you up to 30% on your production costs and why so many of our clients come back to our booking agency year after year to enjoy our hassle free service when they want to book big name entertainment for corporate events, private parties and public concerts worldwide." "The first thing I do when I am planning my event for next year is call Steve at BookingEntertainment. Our event is at the Waldorf Astoria every year, and the team at BookingEntertainment delivers a perfect experience year after year. No matter what time we get in the room, BookingEntertainment makes it work." "They make corporate event planning a snap!! When we were looking for an entertainment agency while in the party planning stage of our event, BookingEntertainment.com was the only talent agency that we felt comfortable with. They delivered in a huge way. We loved dealing with them and the event was perfect." "Our events with BookingEntertainment have been perfect. They saved us over $200,000 in costs that were needlessly spent in previous years." 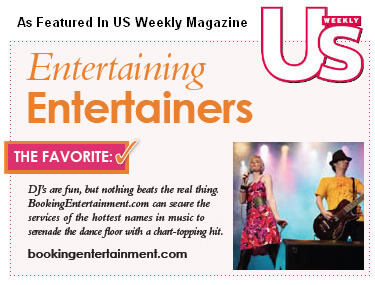 "BookingEntertainment is one of my favorite vendors. As the corporate meeting planner for a Fortune 500 company, my logistics sometimes incorporate more than 1000 people over several days of meetings and events. Year after year, the final evening concert is a SMASH!! With BookingEntertainment ensuring every last detail is attended to, I am free to relax and enjoy the show with my clients and colleagues." "Booking Entertainment is a first-rate company that provides more than just booking services. From solid recommendations that fit the target audience to top-notch event production, Booking Entertainment truly delivers. I've been working with Steve Einzig and his staff for over two years on all of our events and highly value their professionalism. Once I have made the call, I know that I don't have to worry about the entertainment for the event. That kind of comfort and assurance is priceless."